The vase or bottle-shaped flowers of soapwort gentian are blue or purple and closed. The leaves are opposite, entire, lanceolate, hairless, and a bit shiny. This native perennial plant blooms from August to October. The flowers are pollinated by bumble bees, which have to fight their way into the flower. Sometimes they chew their way in, as one of the flowers below suggests. 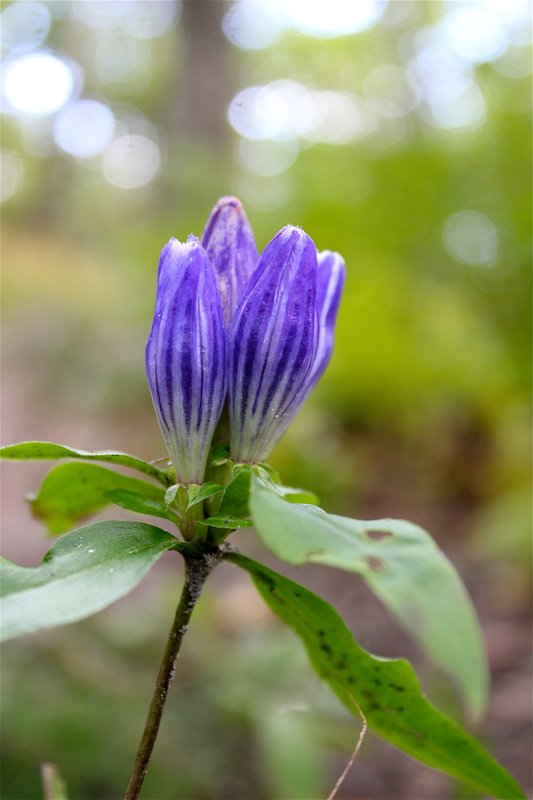 These plants were found blooming in September in the woods at Mountain Lake Conservancy. Compare this plant to another related species living in our area, Stiff Gentian. Unlike Soapwort Gentian, Stiff Gentian flowers OPEN into 5 pointy lobes. A bumblebee has been here. To reach the sweet nectar, the bee has to fight its way inside, or chew a hole.